the pedro joind in punched the prefect and got away with it!!!!!!!!!!!!!!!!! Does this look like heaven? I was chasing Eunice, shoving her by calling her names, and a nearby prefect just stood there talking to himself and watching the whole thing. Petey's stripper joke really got to me for a while. lol i have no idea why he did it in the first place. 1. I was at the carnival and i got off my go kart when a greaser punched a prep and started running from the cops so the cop took my go kart and went chasin' the greaser. 2.I was walking to my next class when a jock comes up a leg-sweeps me and the prefect right there busts me instead of the jock who hit me. 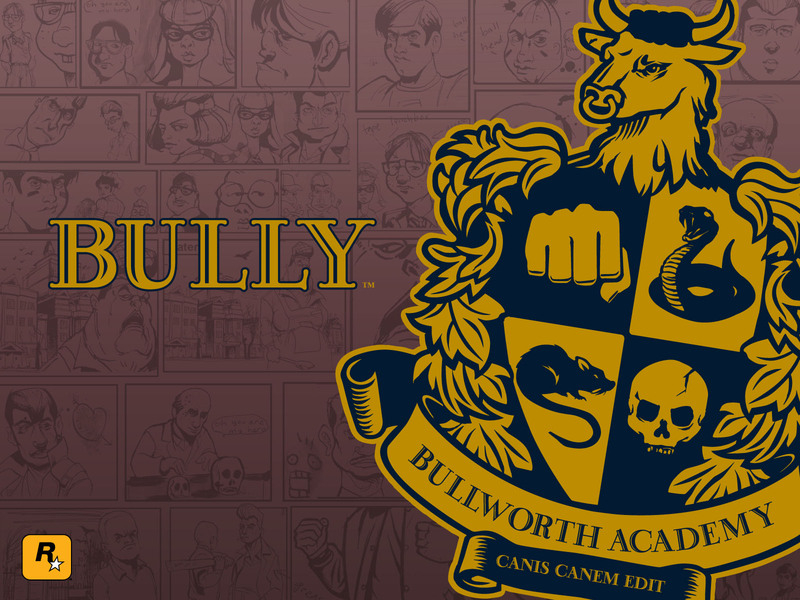 I'm new to the forums here, but I've had Bully for a while, and plenty of WTF moments have happened to me. To start with: In the boy's dorm common room I was harrassing Algie and he started bullying himself! He just sat there while he recieved a wedgie and a slap in the face by no one. Then he froze in place, strange! The other day I walked past Bucky while he was talking to a group of nerds and he said "Have you ever put a peanut butter sandwich down your pants?" Damn, that was way to much info Bucky! After you complete the 2 Asylum Missions, put on the Orderly costume, and return to the asylum grounds --- The other Orderlys will ignore you, enter the Asylum, where those Ordrelys will also ignore you -- go to the rec room, and you will be able to shoot or kick open the door to Block "C", even though there is no blue arrow under it -- continue into block "C", there is plenty of rubble & such laying around, find your way into the Mourgue room, from there into the Furnace room...There is an Exit door, go through it, and you will find yourself in a fenced-In yard -- with no way out, and....WTF !! You can't re-enter the Asylum, and you are stuck there, In that yard.....Passing out at 2 AM won't help, you will only wake up there also.........WTF !!!!!!!! I've gotten stuck in the fenced in asylum area. But there is a way out. shoot an orderly with your sling shot a couple of times. the first few times he wont do anything,but after a while he'll come run at you. stand as close to the wall as you can and he'll grab you through the wall and bust you. For my own WTF? i was walking around the school when i saw one of the jocks(i think damon) beating the crap out of Mr. Wiggins, the history teacher! WTF!? I just had a WTF moment the other day when I saw Gordon making small talk in the dorm and he said: "You know Lance? He's so stupid I bet he can't even read!" and ya know who was standing there talking to him? Well I'll give you a guess. It got funnier when he replied "Yeah I know"
Today I was driving the Go-kart when I knocked Angie off of her bike with it. But wait! It gets better! There was a perfect nearby and he decided he wanted to use the bike. When he hopped on, Angie wanted her bike back so she ran over and tried to push Edward off, but he would have none of that and punched her right in the face while still seated on the bike! I laughed so hard when I saw this happen. Page created in 0.364 seconds with 24 queries.